Season 5 of Homeland started off on a surprising note, Carrie Mathison in a Catholic church, receiving Holy Communion. Soon after we witness Carrie in church, we see she has settled into a quiet, almost normal life in Berlin Germany with her daughter Frannie and is in a steady relationship with her boyfriend Jonas. Of course Homeland would not be Homeland if it did not shake this peaceful and serene lifestyle of Carrie’s off its foundation and thrust her into more action and death defying maneuvers. But instead of analyzing this interesting facet of Carrie, I feel it’s worthwhile to examine how religion is reflected, represented, and posed in the Homeland narrative. Season 5 follows a two year time jump after the bloodbath at the Embassy in Islamabad. I guess two years is plenty of time for Carrie to leave her prestigious position at the CIA, find a new and impressive gig as head of security for a German billionaire at a foundation, settle into living quarters in a foreign country while getting acclimated to being a mother, and not only find a boyfriend, but settle into a committed and loving relationship with him. That’s a lot of changes in a span of only two years! Yet Carrie can do all this and reconnect with her Catholic upbringing. According to Trishia Cerdena at Christianity Daily, deciding to show Carrie in a religious setting was deliberate. “We were always wrestling with the idea that Carrie had rediscovered her faith. Her father was Catholic and she was essentially raised Catholic, confirmed and then lapsed,” co-creator Alex Gansa explained. Her return to her Catholic upbringing emphasizes a softer, more material side of Carrie which has her settling in a new environment in which she enjoys a certain degree of stability. This is evident when we hear Carrie refer to her life as “a more happy one”, while bemoaning having to get dragged back into her CIA life. “It’s like my old life came back,” Carrie says after conversing with Laura Sutton, who wanted Carrie to confirm the authenticity of emails detailing highly sensitive information as a result of a CIA data breech, “Everything I moved here to get away from.” The use of religion as a plot device seemingly plays a key role in Carrie’s life at the moment while also offering a good mechanism to articulate her guilt of her former life. By showcasing Carrie take Communion, it becomes a symbol that she’s having a dialogue with herself about something (possibly atoning for all of the civilian deaths under her leadership). According to Tim Stanley of the Catholic Herald, the sudden emergence of a Catholic theme is tempting to draw a parallel between some of the representations of Islam and those of Mother Church unveiled in this new series. They both look foreign – even Eastern. They both demand commitment to something beyond the nation state. They both make people do extraordinary things for reasons that sometimes defy logic. We have known for quite sometime that Saul Berenson is Jewish. The tough talking, frequently cursing, Yiddish-using character of Saul has been a milestone for Jews on television. We learned about his strict Jewish upbringing in a small Indiana town when he was on the road with domestic terrorist Aileen, trying to get her to open up about her co-conspirators. In the electrifying second season finale, in a highly dramatic scene, we see Saul saying the Kaddish prayer while standing in front of 200 dead bodies after a mass terror attack at the CIA headquarters. 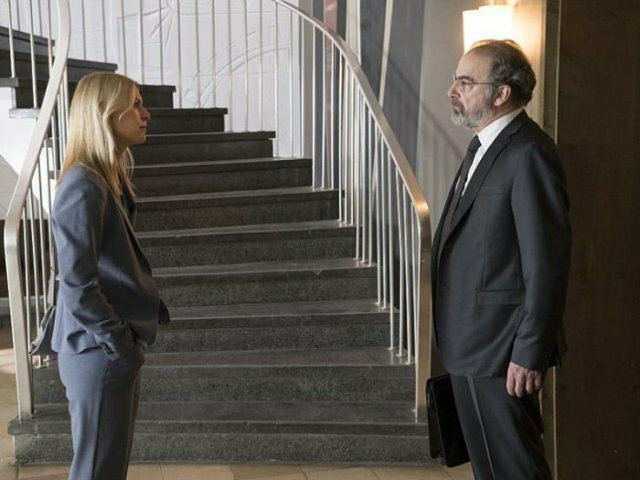 For much of the episodes in Homeland, Saul’s faith is just part of his identity, separate from his professional life, and serves as fodder for his relationships with Israel and other Middle Eastern countries. However in Season 5, Saul’s Jewishness brought forth Zionism front and center. This was established at a Passover Seder Saul attended with his secret new girlfriend Allison (huh, what happened to Mira?!) at the home of Etai Luskin, who we learn is the Israeli ambassador and an old intelligence buddy of Saul’s. According to Sonia Saraiya at Salon, “Homeland” is based on an Israeli show by Gideon Raff called “Prisoners of War,” and though the two shows have diverged dramatically since “Homeland’s” first season, the notion of a divinely granted homeland is one that both shows have worked to examine, through the eyes of many different characters of many different faiths. In the fifth season it’s finally coming home, in a way. Early on in the series, Sargent Nicholas Brody was introduced as Christian (not sure if the denomination was ever stated) American who converted to Islam. In an earlier reading assignment, scholar Daniel Tutt mentioned how the use of Islam throws even more grey matter into the religious dimension to terrorism. For example, Brody admitted to Carrie that his conversion to Islam was partially a coping mechanism for the hell he was going through. Brody’s reason was articulated when he quipped: “Well, they didn’t have many Bibles over there. Don’t you think you’d turn to religion if you had to face what I faced?” As subsequent episodes unfolded, it became apparent that although Islam became an important part of Brody’s identity, it did not radicalize him. In other words, Brody was more of a political radical than a religious zealot. The use of religion as a plot device is interesting because not only does it add depth to the characterization of the show’s front runners, but it aids in representing certain emotions (such as guilt in Carrie’s case) or foreshadows the future direction of the narrative. Of course much analysis has been done with regards to depictions of Islam (the unessential maneuver of Brody burying the Quran), it will be interesting to see if Catholicism and Judaism will be brought more into prominence as Season 5 continues to unfold.